The very first time I walked through our soon-to-be new home, my eyes gleamed when I saw this closet. The previous owners had coats hanging in here, so un-imaginative! 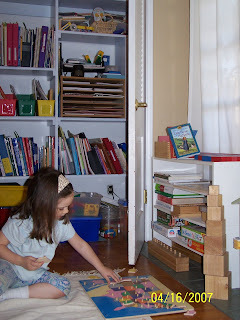 I looked, and saw a homeschool closet, home to my curriculum-addiction. Sky custom built the shelves here to hold all my stuff..ahem, educational materials.